Sometimes I forget that my Mum is dead. More than once I’ve met up with someone I’ve not seen for a while who didn’t already know about Mum, they’ve asked how I am and I genuinely forget. And then I remember. Other times it’s all I can think about, all I want to talk about. Every landmark since Mum died hammers home the absence of her. The May bank holiday filled with the sunshine and spring flowers Mum loved so much were a reminder of another new season starting without her. At Easter I couldn’t stop thinking about the gap on the sofa where she should have been at my aunt’s house. I spent Mother’s Day trying and failing to avoid people wandering around with bunches of flowers, mothers and daughters in cafes and restaurants were everywhere I turned. 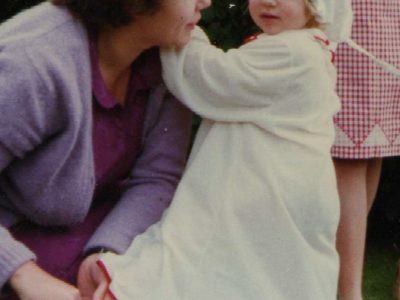 The prospect of my first motherless birthday made me dissolve into tears every time I thought about it, although the reality of both my birthday and Christmas three days later were much less painful than I’d feared. Escaping the ghosts of previous Somerset Christmases with our first London Christmas, and building new traditions with the newest and cutest member of the family definitely helped. I’ve been told that the first time for each of these landmarks is the most painful, navigating new traditions, experiencing that absence in that context for the first time. Easter was never that big a deal in itself, but this Easter was sad for a different landmark. Last year’s Easter holidays was the last time I was with Mum at home. And it’s a memory that makes me laugh as well as cry. I had, as always, tried to fit in too much to my last morning at home (a dentist appointment for Mum that I knew would be stressful and upsetting for both of us, last minute cooking to fill up the freezer, the never-ending admin). When we should have been leaving for the dentist I was still running around trying to do things and found myself bursting into tears. Mum’s response to this was to stroke my arm, smile fondly and soothe me by repeatedly calling me a ‘silly girl’ (which I was), segueing into ‘silly cow’ (insults being a term of endearment from my mother) and finally into ‘silly boy’. By which stage we were both laughing. It was the first time in a long time that I’d been mothered and as last memories go it’s a good one. A couple of weeks after that she went into hospital. And a few weeks after that to the care home. And then she faded away. The mega-watt smiles became weaker and rarer. Her remaining speech tailed off. Foot-tapping and hand-waving to music all but disappeared. Recognition of any of us slowly dripped away. It felt like she’d just had enough. She’d been fighting really hard for a really long time and it was time. We’d been grieving for her for the last 11 years as she slipped away piece by piece, but suddenly she wasn’t there at all. I still can’t get my head round the idea that she just doesn’t exist anymore. My sister and I have both noticed how our friends ask “How’s your Dad?” and “How’s your sister?”, but rarely “How are you?”. We’ve all been so grateful for the thoughtfulness and concern from near and far over the months since Mum died, so that’s in no way a criticism. I understand the awkwardness and have felt it myself around friends who have lost someone before experiencing my own bereavement – and no doubt will again. I always felt that grief was a private thing, and I didn’t want to intrude on that. It’s hard to know what to say to someone who has lost a loved one, and I don’t have any useful suggestions other than not avoiding the subject. I’m not claiming to speak to everyone who has lost someone – just as everyone’s experience with dementia is different, so is everyone’s experience of bereavement – but it’s nice to know people are thinking of you and haven’t forgotten your loss, and how it changes everything. It’s also hard to answer the “How are you?” question when it does come. I’m ok, except when I’m not. Grief comes in waves and you never know when it will hit. I often dream about Mum – normally of her as she used to be, bossing us around, laughing, cooking up a storm. I wake up sad and I can’t shake it all day. Spending my days with 28 hilarious 6 and 7-year olds has mostly been an excellent distraction, but the lack of filter can also be tricky, as when one of my kids came dancing up to me at break time and asked me out of the blue “How did your mum die, Miss Turnbull?”. It was already a day of feeling sad and I struggled to keep it together. A blog that I stumbled upon struck a chord about this – people worrying about reminding you of your loved one and causing you unnecessary pain. 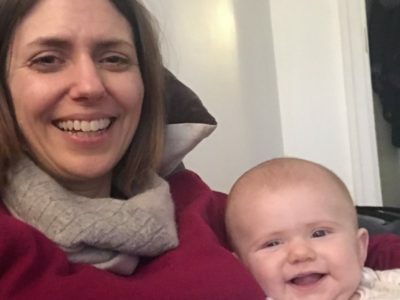 As the writer says, for me acknowledging the absence actually makes me feel better (even if it opens up the risk of public crying), knowing that I ‘can be both wounded and normal’, and more than that, giving me a chance to talk about Mum – an opportunity I always grab onto. I also found the line that I have shamelessly borrowed for the title of this blog very helpful. Sometimes I feel like I should be ok by now. Mum died over 8 months ago. But it’s not as simple as that. 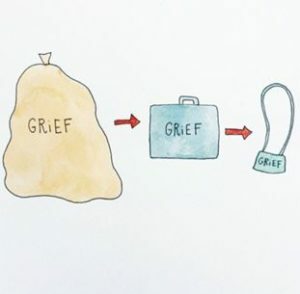 Alongside the ‘no shelf life’ idea, this illustration sums it up well; the idea that you never get rid of grief altogether, it just changes shape and gets easier to carry around with you. Mum spent over 20 years working at the local hospice. Her job involved supporting families around the death of a loved one, and the outpouring of stories from local people after her death showed just how good she was at it. The day after she died we found a recording from a local radio interview she’d given years ago about the work of the hospice. She spoke eloquently about how people should talk openly about death, should get ready for it and then get on with living. It was amazing to hear her speaking so coherently, to hear her laugh, to hear Bridget being Bridget. A video my sister saw on social media reminded me of that recording, as well as making me feel better about Mum’s last hours. It also made me want to try and put all of these ideas down in one place. Writing these blogs has always been difficult for me; sharing such personal stuff doesn’t come easily to me, but at the same time it’s always been therapeutic. And, in the same way that we hoped sharing these blogs would get people talking about dementia more openly, if any of it can get people talking more openly about death and about grieving (myself included) then all the better. Some other links… Here’s another short film that covers a lot of the ideas above. The Griefcast podcast manages to explore grief and death and make you laugh (and sometimes cry) at the same time. I’ve found these resources really helpful so wanted to put them all in one place in case they could be useful to others. If you have any links you’d like to share please include them in the comments. For me I know i’ve been more hurt by people who knew not asking how I am than any awkwardness of those who didn’t know asking and me not having an answer…… but then I probably answered “i’m fine” too many times when it was a lie, so I know it’s hard for people. Well written Jnr, and thanks for the reminder that it’s normal to still hurt and miss people. Ali, your Ma enhanced the quality of Somerset life by her work, and also by the birth of her daughters! Very nicely written, my dear!